At Uncle Bill’s Pet Center, we not only offer Starmark dog toys for sale, we also employ a highly trained staff that can assist you in finding the appropriate toy for your dog. The Everlasting Beanie Ball can be filled with food, Every Flavor Treats, or any snack your dog enjoys and then capped with one Everlasting Treat. 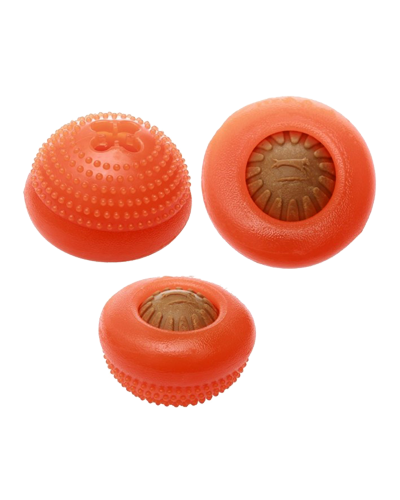 Everlasting Treats can be inserted upside down or into the center cavity for more challenging play. Dental dimples on the outside help keep teeth clean. Dishwasher safe in the top rack for easy clean up. Completely free of latex, vinyl, and phthalates. The Everlasting Beanie Ball is made from a highly durable, tear resistant material that holds up the toughest chewers. The unique design allows it to roll erratically, enticing your dog to play. We will be glad to work with you to ensure that your pet enjoys quality toys for optimal health and happiness by providing the best selection and value on premium dog toys for sale in Indiana.